After shearing, we hand wash fleeces, then dry or dye them. Dying protein fibers is part art, part science. One time, we aimed for deep “Chinese Red” and produced a luscious moss green instead. 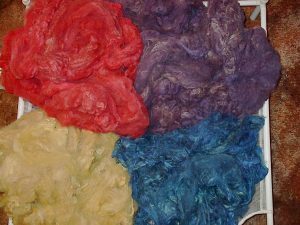 Our dyes are light and washfast and should last the life of the garment. Sold by the ounce. Custom orders accepted.